lucky magazine asked us to partner up with them to share some of our favorite tips on streamlining our morning routines, in conjunction with vaseline spray & go, a brand new, compressed air body moisturizer (doesn't gunk up between your fingers or in your rings when you apply it--genius). shower at night // when huck was a newborn i quickly discovered that morning showers were no longer gonna work. i switched to a nighttime shower, after the baby was asleep or once daddy was home to help out. i can't believe i didn't start this one sooner--who wants to wake up twenty minutes early for a shower anyway? use multitasking beauty products // i prefer to wear bb creams or tinted moisturizers so i have one less product to fuss with. i especially love double duty products like cream blushes that also work as lip color. have a go-to hair style in your arsenal that doesn't take a lot of time and always looks good // a slouchy pony tail, or maybe a deep side part with a sparkly barrette (trés trendy right now). sometimes i like to remind myself that the french almost never have perfect hair, and if it's good enough for the french, it's good enough for me. serious game changer, the momiform. this post was sponsored by lucky mag. thank you as always for supporting the businesses that help support our family! OMG I love this! I totally have a momiform too! I miss having an actual school uniform way back when so I long for a non-mom-iform too ;) Natalie do you wear your leggings doubled up so they aren't as sheer? 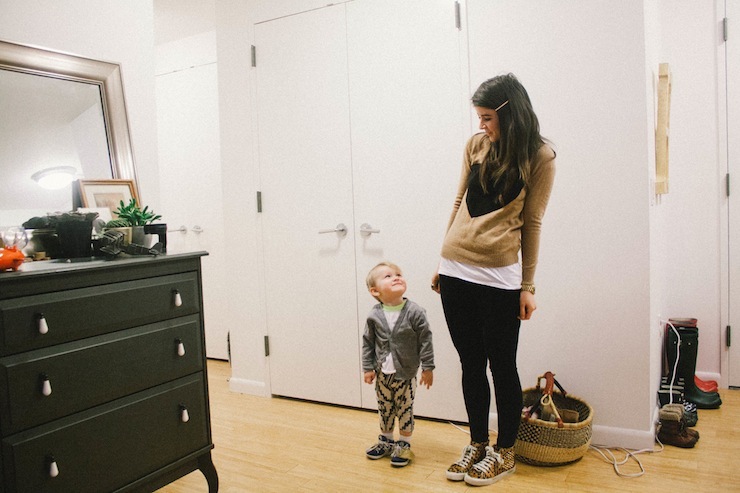 this was honestly my favorite post from a mommy blog so far because I'm a mom-to-be and I was wondering how I was going to juggle actually looking put together. i was a huge fan of the night time shower! i didn't start showering in the morning until my kids were 8 & 10 when the started sleeping in past me and really the only reason i did switch back was to get some alone time with my husband every morning. 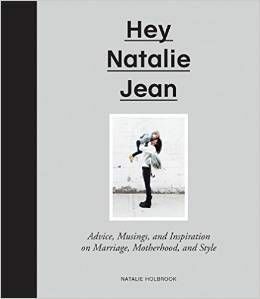 These are great recommendations and exactly what I did in becoming a new Mom! Seriously, these should be added to the handbook somewhere. that is the cutest momiform ever! great tips! i don't have kids, but i can def appreciate the time saver that is a nighttime shower! i'm echoing k8te, i don't have kids either, but love the idea of a uniform (i definitely have a work uniform! ), and night showers are my life. I love the momiform! I have a bit of a studentiform myself, which includes my lightweight graphic sweaters...they're basic, so they pair with everything, but so much fun that I can throw them on without accessories and still make a statement :). Love your momiform look! Very comfy and casual. And I also took showers at night when my boy was little. Haha. Huck has the most expressive face. 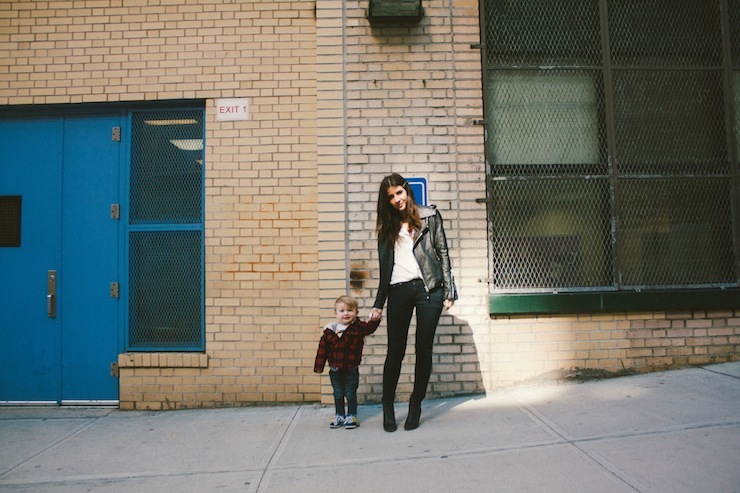 You are one lucky mama! I love your momiform! Especially those shoes! Can you do a post that talks more about your lash routine. I don't have the budget for extensions and am curious about false lashes. What kind do you use? What is your application method? love that you do fake lashes in a classy fashion. I wish I could apply them as easily as you do! Showering at night is a trick I learned way back in high school. Unfortunatly, these days I'm so tired all I want to do is fall into bed. It all evens out though with the curly hair. I literally don't have to wash it for days. Although maybe I shouldn't admit that on the internet. Seriously. I need a momiform...and a kid. Definitely loving your "momiform" and I don't even have a baby! Great series girl!! Showering at night was like... the best revelation of my life. Simplified EVERYTHING. And I like your momiform. The staples in my wardrobe are leggings and sweaters, for sure. Love this! I do all of those things except the fake lashes (maybe I should give it a go?). Although sometimes I just pull my chubby baby into the shower with me and we sit on the floor and have a jolly good time. 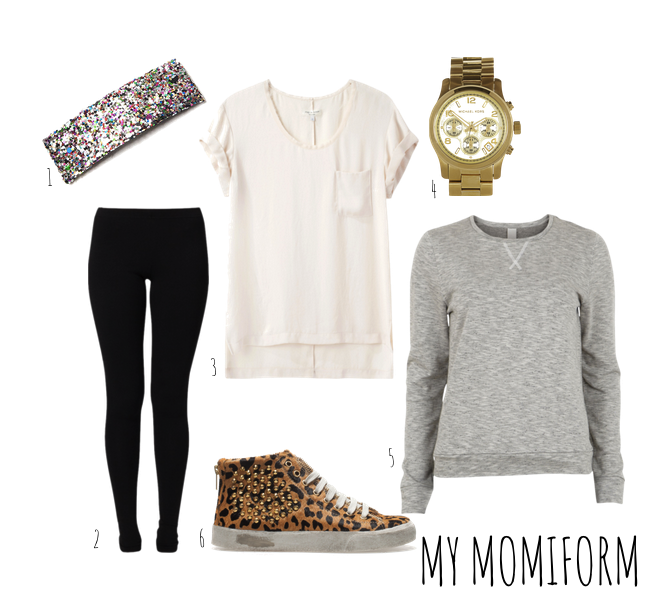 My momiform includes a gray v-neck, bright colored jeans, keds, and a slouchy hat! We would look pretty stellar together lol. Thanks as always for sharing. I've never been one to shower in the morning because I've always wanted those extra "few minutes". Once I had a kid it def. helped with the whole baby routine. You have a cute momiform! Love these photos! Where is the shirt from that you posted? The Rag&Bone one is different but I love the one you posted here. i love the momiform! i don't have kids, but that just makes sense! I immediately became obsessed with those rad leopard hi tops. I've loved hi-tops since owning a pair of red ones when I was a kid and these compare equally, of course, so I bought them! Eep. I hope I love them as much in person as I do after seeing the way you style them. :) Thanks for sharing.